Published last month and available on Amazon or HOEPLI.it, the book is nearly 200 pages of fresh, tactical search marketing methodologies, trends and tips. I caught up with Ale over the weekend to get the deets on the book, what people will learn and why it’s the perfect time for the European business community to embrace self-education in Web marketing. Jessica: Tell me about the book, what’s behind it and who should read it? Ale: Most traditional or conventional marketers do not fully understand how to do SEO and PPC because of thetechnicality that is needed to perform these activities. That’s why we wrote this practical search marketing book for business people that explains Web marketing strategy in a straightforward manner. Anybody who is currently running a business, in charge of marketing or sales should read this book. The book is also a great tool for SEO analysts and SEM practitioners. What kinds of things can readers expect to learn? How to increase visibility in search engine results. How to generate qualified traffic to your site. How to make Web marketing a powerful advertising sales and public relations tool for your business. How to integrate SEO into press releases, online video and social media. The philosophy behind the book is explained in a short video on, “Trovare clienti con Google” (video in Italian). Why was the time right for an Internet marketing book like this in Italy? In Italy, as well as the rest of Europe, a large proportion of companies continue to increase their investment in both paid search, SEO and social media. But most of these firms (probably 99 percent) are outsourcing search and social media without having enough knowledge or experience on how to assess the quality of these services. That’s why I believe the time is right for a book like this; it’s an easy read and gives a good understanding of sound search marketing practices, which can be immediately applied to the reader’s business. Will the book be published in any other languages? We are currently thinking about localizing and publishing the book in some European languages like German, French, Spanish, Polish and Dutch. If anybody is interested in seeing the book in their native language, please let us know. What other educational things will Bruce Clay Europe be involved in for 2012? Bruce Clay himself will come to Italy to join Bruce Clay Europe in June 2012 to teach the annual SEO training course. Last year was the first of it’s kind and was wildly popular amongst the European business community. Besides that, I will probably speak at SMX West in San Jose in February, and again at SMX Munich in March. 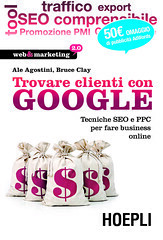 If you have questions about the book “Trovare clienti con Google” or anything else related to Web marketing or Bruce Clay Europe, you can reach Ale on Twitter or his profile on Google+. Does this book tackles about Social media optimization which is by the coming years will continue to burst?